Firstly, my book ’19’ will be released on the 27th October. 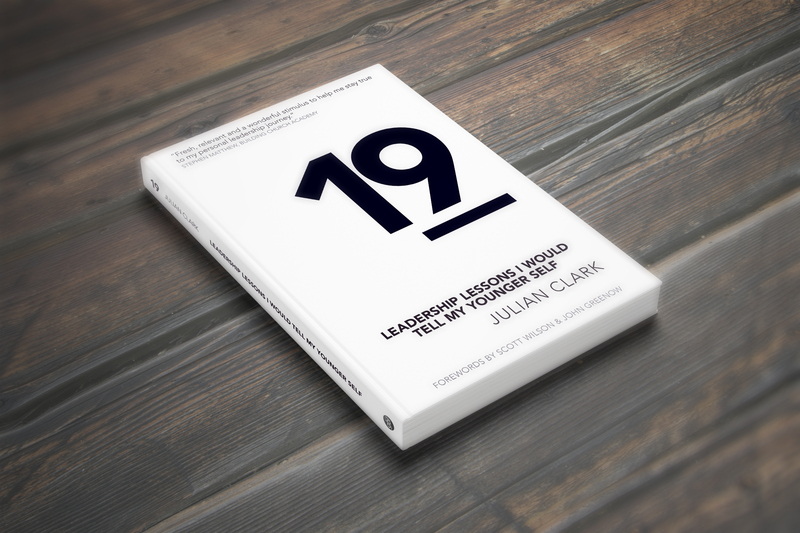 This is a book for leaders of all ages but very much to those beginning on their leadership journey. I was 19 when I was given my first introduction to leadership, becoming the leader of the local church youth group. Now, 28 years later, I am still leading in local church, and I am passing on what I have learned along the way. Things I know any young leader will need to learn so they can still be leading in 25 years time. Secondly, the website The 19 Project is live. Very much coming from the premise of the book and my desire to help resource and raise the next generation of young leaders, my hope is the site will become a hub of useful articles, free resource and eventually offer access to live Q&A’s, training material, connection with other leaders, and much more. You can join The 19 Project and help to shape it for the future. It’s free. When you do this, you will be able to download a free chapter of the book, pre-order it at a discounted rate and take a quick survey to provide some initial feedback on the site. Will You Share Your Thoughts? Just click below to answer 6 very short and quick questions. It only takes 2 minutes!! Check out the Bonus question too if you’d like to get early access. Leadership is a funny thing. I have learned many things during the past twenty-odd years in various leadership roles, some of which have been much simpler than others to grasp but no less important. This would be one of them: leaders show up. Think about it, in all different arenas of life, from politics, to business, to the local community, to the church and in sport, we look for the leaders. We celebrate those individuals who dare to make a decision, those who will lead, those who will grab the game by the scruff of its neck, those who instill some passion in others, or who bring clarity to proceedings. They remind us about the cause, that it is possible and show us how we can get there. People are looking for a leader who will show up, and not just at the end when the plaudits are out. This kind of leader displays a characteristic often taken forgranted by those who ‘have made it’ and who begin to forget to show up. Be the kind of leader who will show up, not just show off. Show up to get stuff done. Show up to work alongside your team. Show up to say thanks to that team. Show up in good times. Show up in a crisis. Show up all the time. Show up when it’s convenient. Show up when it’s inconvenient. Show up when there is no one else to see you show up. Show up and become credible. Show up and be the best leader you can possible be. Reading Ben Franklin’s autobiography has challenged me in my leadership. His ability to come up with a plan for how to do life at the age of 20 is astounding. I’m 45 and still trying to figure some of that out. He possibly birthed the idea of self-discipline and how such an attitude helps in producing a successful life. Let’s be honest, he did alright on that philosophy. My leadership and therefore my influence is poor in comparison, but I am inspired. Temperance: eat not to dullness; drink not to elevation. In other words don’t overindulge in food or drink. In keeping this he felt that others would easier to follow. Silence: speak not but what may benefit others or yourself; avoid trifling conversation. This is first to gain knowledge, which you do better by listening rather than always talking. Second it was about stopping the silliness, ‘the prattling & joking’ as he put it which is the lowest form of conversation. Order: let all your things have their places; let each part of your business have its time. Order is about making progress, having time for the right and beneficial things. It requires self-discipline to keep all aspects of business within its allotted time. Resolution: resolve perform what you ought; perform without fail what you resolve. If you say what you’re going to do it, then do it. Frugality: make no expense but to do good to others or yourself; waste nothing. This is not about being stingy but about being purposeful with what you have. Industry: lose no time; be always employed in something; cut off all unnecessary actions. Laziness is not a virtue to be celebrated. A willingness toward hard work, contributing and adding value is essential. You want success as a leader and a person then frugality and industry are extremely worthwhile partners. Sincerity: use no hurtful deceit; think innocently and justly, and, if you speak, speak accordingly. Words matter. How we treat others matters. Personally, I would rather be thought of as sincere than insincere. Justice: wrong none by doing injuries, or omitting the benefits that are your duty. Be ready and willing to fight for what is right. Don’t knowingly hurt another or knowingly avoid standing on behalf of another either. Moderation: avoid extremes; forbear resenting injuries so much as you think they deserve. Cleanliness: tolerate no uncleanliness in body, clothes or habituation. A leader who cannot look after themselves well is not a leader that others would want to follow. Tranquility: be not disturbed at trifles, or at accidents common or avoidable. Keep the peace, be at peace, don’t rise to everything. Chastity: rarely use venery (sexual indulgence) but for health or offspring, never to dullness, weakness, or the injury of your own or another’s peace or reputation. Enough said really. How would you score? I looked at this list, amazed at its simplicity but also at its depth and power in its potential for making me a better leader. So I thought I’d give the plan a go. Franklin kept a record at the end of each day to note if he had failed, the aim being that with the focus on one virtue each week he would begin to see some change over time. I’ll let you know how it goes. Or if you know me, maybe you will let me know how it goes. Simon Sinek in his book ‘Start with Why’ says that ‘people don’t buy WHAT you do, they buy WHY you do it’. WHAT can change but WHY is simple. It’s the discipline to never veer from the cause. It captures the heart. The vision, the cause, is the why. It can grab someone’s imagination as they begin to see what could be possible. It’s bigger than what we do. Why isn’t what. What we do can almost be irrelevant when we understand why we are doing it. That kind of belief can help build great success. It keeps us going when it gets tough. What we do can get boring, inconvenient or tiresome. On those cold, rainy days we can opt out of ‘what’. The why reminds about the difference we are making or the reason for what we are doing. It encourages people to be creative. If the why is clear then people have a freedom to be creative with the what. Leaders shouldn’t have to come up with all the best ideas, instead, the ‘why’ creates that environment where great ideas can sprout from anywhere. It brings what you do to life. When those within get the why, then people will see what you believe through what you are doing. I have not always been great at explaining the why. I know that I still get it wrong. I can argue it’s not my role as I’m not the lead man, but that’s a cop out. If I lead people then I have to be concerned about the why. If I am part of the organisation then understanding the why is my responsibility. If it’s not clear, I should ask. Telling people what to do isn’t difficult. To articulate the why though, requires time, thought and care. That a whole lot of effort. It doesn’t always come easy. I have to give more than a ‘just because’, or point to my position. It has to be important to me because the why is inspiring, it stirs up passion and people are more willing to give their time, talent and treasure to a really good, strong, clear why. Are you somewhere that has a strong why? As leaders, are we doing all we can to help others grab a hold of that why? I may not be a great leader but I am doing pretty well. I realise that may seem somewhat presumptuous on my part, and those I lead will have their own opinion. I am willing to admit the mistakes I have made. As I lead I must make sure to help you understand me more. If you don’t ‘get’ me I can easily blame you but that would be wrong. I am responsible for how I come across, the words that I speak, the actions I take, how they impact others. I have to be disciplined in getting out of the way so others can begin and continue to grow. We are not as clever as all of us. I am privileged to be doing what I am doing but I MUST make way for others. Just because I can doesn’t mean I should. Just because you are not doesn’t mean you can’t. I must keep asking for and work hard to keep my permission to lead. It’s not always about what we achieve but how we achieve. Character, integrity, heart are things that people follow. To keep your permission I must guard against damaging or losing these. I need to stay teachable, to keep my attitude for learning. For me that includes reading, listening and feedback, as well as most importantly having an awareness of what God is saying and doing. What about you? What have you been learning about yourself in 2015. Over the years I have learned many things but one of the simplest is this: to become a better leader requires discipline. We will all end up somewhere, doing something, there is no doubt in that. Maybe for leaders there is a need to develop a different approach, one not relying on a default way of life but rather one through discipline and design. I was not always great at this and I am still learning. As I watch other leaders and wonder how they achieve what they do I discover this same simple truth: they have developed their leadership disciplines. As a leader I have had to ask myself, am I happy with my leadership? Am I willing to do what it takes to improve? How can I grow myself as a leader, so that I can become a leader who has what it takes to grow others? What are your specific leadership disciplines? I have a few and will unpack them in some upcoming posts. Among the many things I have learned on my leadership journey this particular ability is an ongoing area for improvement. Sometimes you get it right, others times, not so much. Tell me what you think after reading this. It is tough being in charge. Making things happen. Getting others to make things happen. It can bring you great joy but it can also bring you great frustration too. The challenge is to not become impatient for the wrong things, only for the right things. Being impatient can be good BUT it can cause us to react badly, to become excessively brash, to assert our authority inappropriately, to make rash decisions, to upset the team, to be overly nit-picky, to miss out on what is being done well, or just not explain ourselves clearly enough. Impatience for the wrong things can cause us to become passionate about things that in reality don’t really matter. Wanting the best for people and to see them flourish. Rooting out bad practices that hinder the right results. Getting rid of gossip, slander and all wrong kinds of negativity. Helping people remember the why and inspiring them about the future. To not being stuck but making progress with the vision. That we are not seeing the right kind of change in people’s lives, we are not making a difference in our community, we are not fulfilling the call of God on our lives. This is why I think leadership is an art. Getting that balance right can be tricky. People don’t like it when we become impatient about the wrong things or even about the right things but in the wrong way. Yet they will follow us wholeheartedly if we are impatient for the right things and in the right way too. tmmamaleka on Who Are We Taking With Us?